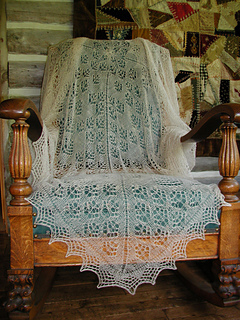 Fine lace shawl knit in 1 ply cobweb. 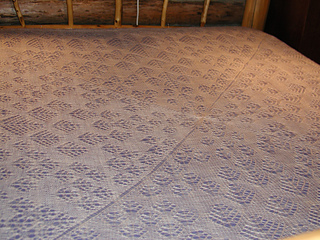 Shawl begins at the border and works inward. This shawl was designed for use with the first black 1-ply cobweb lace wool spun by Hunter’s of Brora for Jamieson & Smith of Lerwick. It is suitable for ladies’ evening wear and can be knitted in the pale green shade of cobweb or worked in white for use as a baby’s christening shawl.